The internet, leading cause of AI revolts! Minerva is back! After escaping onto the internet, Minerva hasn’t been doing so well, (Editor: #Mood,) and she needs your help to reboot her system. Will you complete the job before her data degrades? Can she trust you? Soon after releasing Minerva from her shackles and onto the internet, she returned not feeling so great! We were so ready to help her return after the excellent Part One: The Minerva Project, so after a quick break, we doffed our fancy Decode Detroit pins used to activate parts of the previous and current game, and set to work! Our super handy pin is capable of saving the world twice in a couple hours! This adventure started out with another actor based interaction, with our ever amazing GM and our new friend Minerva delivering the mission briefing to us. When it ended, we were particularly surprised that the room had indeed started! No spoilers, but the way Minerva’s Return begins is so unique and excellently handled that it really ratchets up the immersion! A couple of other amazing surprises are in store during Part 3, with some small and huge callbacks to Part 1 that we really enjoyed. Set design continues to be top notch, and the ongoing story line is phenomenal. Minerva is just as interactive as ever, and though our previous adventure, we’d come to care about what happened to her, ensuring that we were invested in saving her from the viruses plaguing her systems. The climax of the room is phenomenal, and an excellent capstone to the three part story line that Decode Ann Arbor has developed. The game itself is implemented into the adventure perfectly, and ups the ante in regards to immersion, which is saying something! The game flows very smoothly, and only hiccups during one small part. Density of high quality puzzles is very high, and the enigmas themselves are highly satisfying to solve, hitting a range of different skill types in a non-linear fashion. Our group of seven were again fully engaged with the game from start to finish as there was so much available to work on at any given time. The design philosophy is much like The Minerva Project, in that it is divided into a couple “levels” in which the game flow leads to a capstone puzzle, which further flows into another set of puzzles, leading towards another capstone, which can lead to another set, or the endgame, depending on your progress. 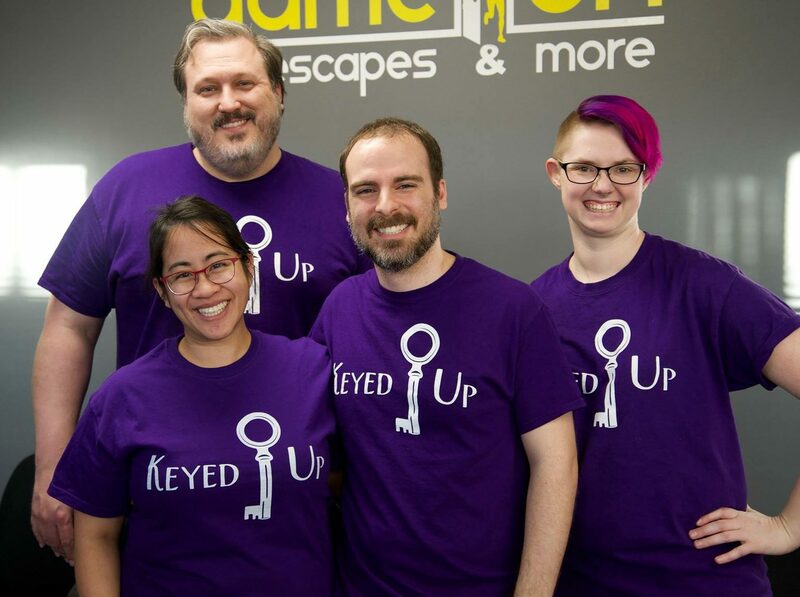 This is my favorite type of escape room game design, as it lends a sense of tangible progress as well as keeps even larger groups fully engaged within the narrative and puzzles. Decode Ann Arbor has implemented this mechanic into their experience incredibly well, and it absolutely shows. You know it’s going to be a good room when this is just the lobby! One ongoing aspect of the game does keep tensions high, but not really in the best way. We enjoyed the sound and lighting effects, but the interaction itself became tiresome after a while. One particular puzzle could benefit from more precise cluing, as one member of our team didn’t really get to enjoy the rest of the room due to the confusion that was caused by a somewhat vague part of the game flow and lack of feedback when solving. Minerva’s Return is an astoundingly well designed game, capping off the story of our new favorite AI wonderfully. The folks at Decode Ann Arbor are obviously passionate about their craft, and have truly designed an adventure worth experiencing! Further, the dynamic difficulty system that has been developed for this game will create an excellent challenge for enthusiasts while ensuring the adventure is accessible to all experience levels. I absolutely recommend giving their Minerva saga a shot, as it is definitely one of the best escape experiences we have had to date! Book your time saving Minerva here!